Back in May my Grandma turned 90 - I can only hope I am as active and independent as she is at the same age. 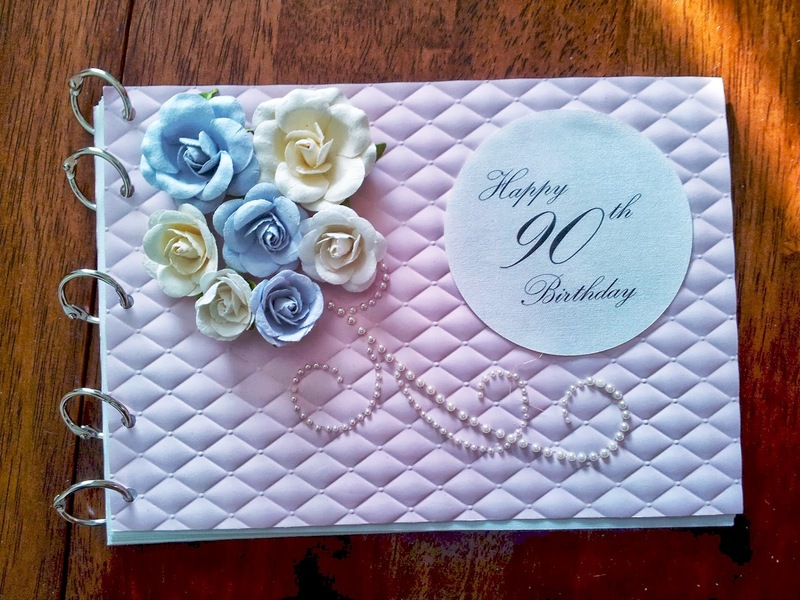 I wanted to make something for her but Grandma did ask for no presents - I figured a guest book for her many, many birthday party and visiting well-wishers would get by though! I ummed and ahhed for a long time making this one but am very glad with the way it came out. It's very Grandma with roses and the colours I chose. I was very busy during the party but one of Grandma's younger sisters ran around with a pen and made sure that everyone signed it! 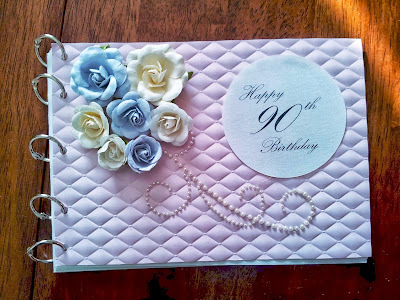 There's not a lot to say on the making of it with such a straightforward design - Paper flourish at Enfield helped me work out how to bind it and helped punch accurate holes using their hole punch - far fancier than anything I had. The rest was an arrangement of elements, the sentiment was printed. At the end of the day the design was simple and construction not complicated. But everyone signed it and made it something really special. It took a little while to get a photo of it - but when I visited Grandma recently I was able to get a quick snap. More people have signed it since the party which is wonderful! It's been a fairly intense month but I hope to post more often again soon - one or two more things to deal with in the next few days then I can start chasing photos and reinstate my craft mat on the dining table!